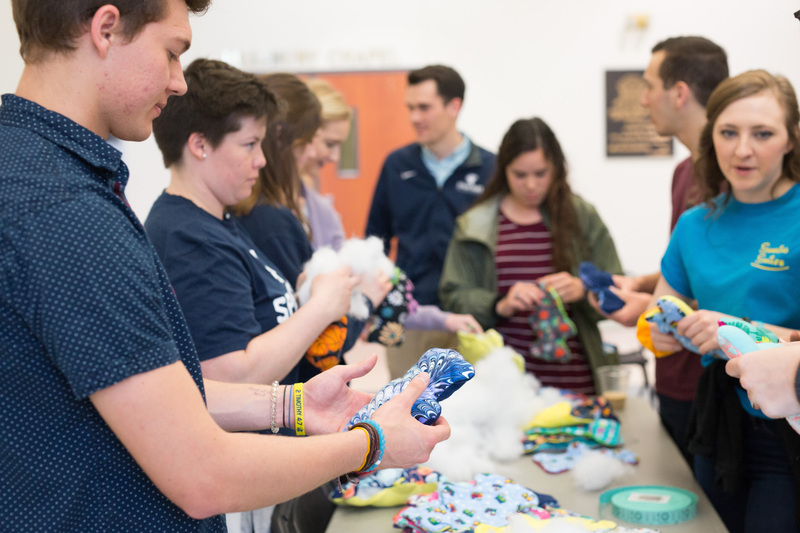 Missouri Baptist University students, faculty and staff gave back to the community for the University’s second Service Day on April 4. Students pack backpacks for children in Ghana and St. Louis. 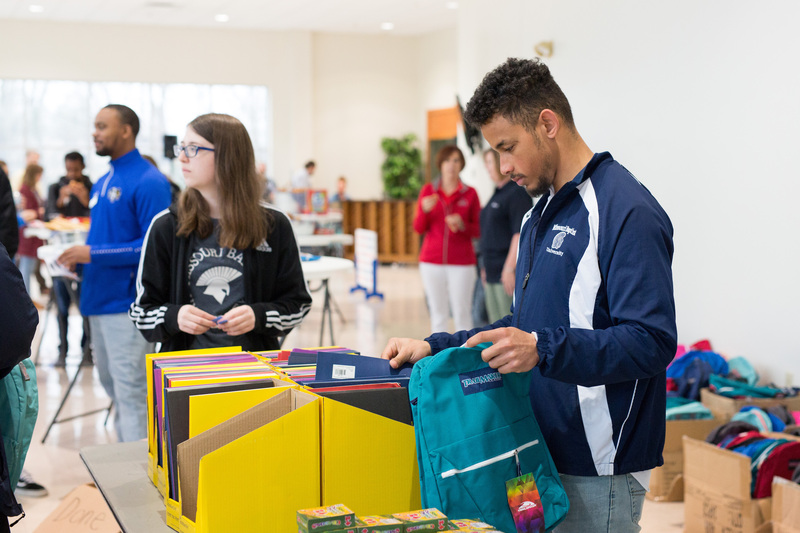 On April 4, the MBU community prepared 500 backpacks, which were donated by the North American Mission Board, with school supplies. Of the 500, 350 backpacks were for children in St. Louis as well as 150 backpacks for children in Ghana. A team of students will be going to Ghana for an educational trip in May under the direction of Dr. Amy Harrison, Assistant Professor of Higher Education Leadership. In addition, more than 300 teddy bears were cut, stitched and stuffed with Sharing Smiles, a non-profit led by MBU student Lindsey Peters, which gives the stuffed animals to children in local hospitals. Clothes were donated with Threads in coordination with MBU sorority Gamma Delta Sigma. Fundraising from the clothes sold in the fall semester will support the International Justice Mission. Students stuff bears for children with illnesses for Sharing Smiles. This semester, the Office of Faith and Service also introduced the on-campus Sharing Shop, where students in need can go for assistance. 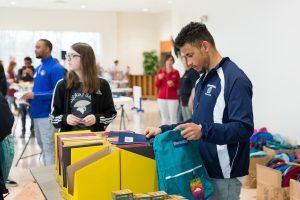 Non-perishable food, clothes and personal items such as toothbrushes and laundry detergent were also donated on Service Day to help stock the shop. Service Days were introduced to the University during the Presidential Inauguration of MBU’s seventh president, Dr. Keith Ross. Hosted by the campus Office of Faith and Service—in collaboration Special Events, ResLife, Student Activities and other organizations both on and off campus—the event will become an ongoing activity for the MBU family each semester.